Our Wilderness Program also offers trips in canoeing, rock climbing, sailing, biking, kayaking and fishing. Some trips are day long and some are overnight. No matter what trip a camper chooses, an immense sense of accomplishment and confidence is achieved. Lifelong skills are developed as well as lifelong friends. 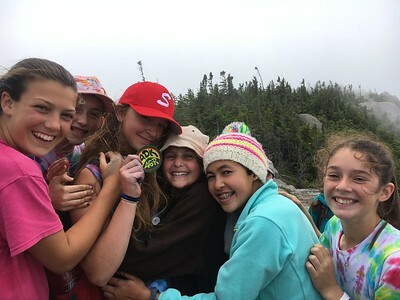 Pok-O-MacCready takes pride in ensuring that every camper has a chance to develop to their greatest potential and our wilderness program is a fun way to get there. For over 100 years, Pok-O-MacCready Camps has established itself as a leader in wilderness programming in the Adirondack Mountains. Steeped in tradition and dating back to a time when you had to hike from the camp to the mountains, the hiking ethics remain the same today. Starting with the younger campers, we slowly introduce them to the joys of outdoor adventures by taking them hiking on novice trails. Here, they enjoy the simple pleasures of being in the forest with their camp friends and counselors. 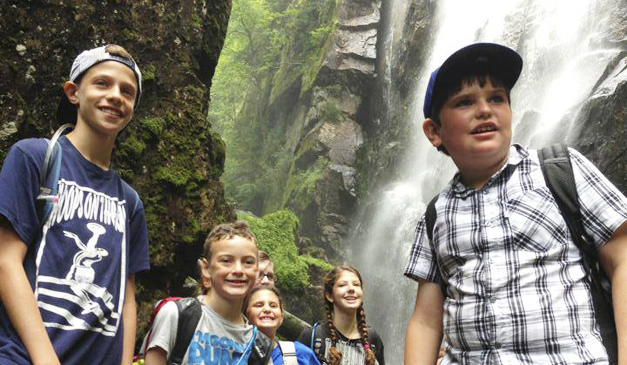 The campers are introduced to the proper back country ethics of “leave no trace.” These easy day trips introduce campers to the wonder of nature and foster an early appreciation for their surroundings. 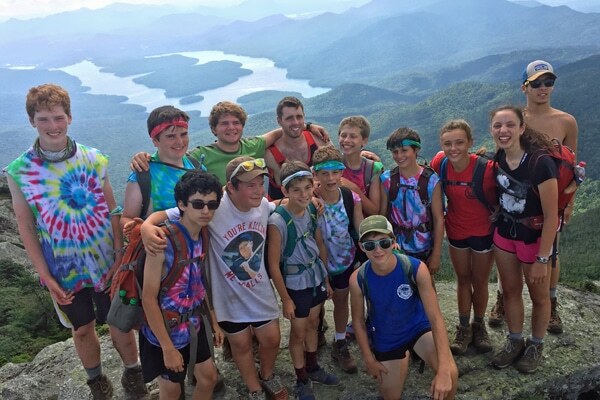 Early introductions and exposure to the woods, often lead to a greater thirst for more adventurous and challenging trips as campers grow and mature at camp. 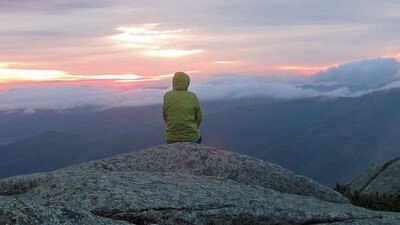 Our most popular trips are hikes to the “high peak” region of the Adirondack Mountains in the quest to achieve the summits of all the 46 peaks over 4000 feet high. Campers who complete all 46 hikes, become “Adirondack 46ers” and are celebrated at our summer banquet. This is a long-term goal which often takes several summers to complete. Over 400 campers and counselors have achieved this goal over the last 100 years! There are also many other hiking possibilities. Our “Pok-O-Patch” is obtained by climbing the 4 mountains that surround Long Pond. Once a camper climbs all 4 mountains they are awarded the Patch. This can be achieved in one summer and many of our campers are awarded this Patch at our summer banquet. The development of skills in summer camp activities is an important aspect of our summer program for kids. 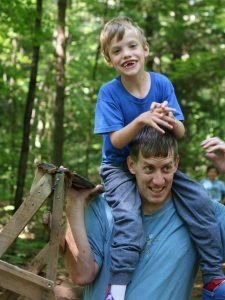 Under the guidance of counselors and specialist instructors, campers have the opportunity to participate in many of the activities listed below. Each camper has a personally chosen schedule and may choose from classes and activities that meet daily or every-other-day. Before picking activities for their schedules, campers take part in an Activity Fair, in which they tour each class area, meet the instructor, and see a demonstration of the class activity. more. Our campers enjoy creating and appreciating the arts in our beautiful scenery. hand to live in the 1800s. in fire building, cooking, shelter construction, survival, and map and compass. build a program to fit the camper’s need. bring home or display in their cabin. waters in the East, including the campers’ favorite end-of-season trip on Lake Champlain! Campers learn the basics of throwing and catching, and then use these skills to learn tricks. spinning the Frisbee on your finger, and competing in Ultimate Frisbee games. preservation, and cultivating the gardens — our campers enjoy the 1812 Homestead. Our English Equestrian program is offered at all levels from leadline to advanced jumping classes. Showing, trail riding, and care of horses and equipment are essential components of the program. Learn more about horseback riding below. region’s Iroqouis Nation and other tribes. for trips. Our kayaks offer an excellent opportunity to view wildlife along the shorelines of our lake. located all around our lake. instruction and encouragement for your child to learn or improve upon his or her talent. The surrounding woods, streams, lakes, and swamps provide an excellent outdoor “classroom”. and other decorative items. Our summer camp has both indoor and outdoor pottery facilities onsite. Advanced Swimmer (Level I – V). Perfection of strokes and confidence in the water are the basic aims. bouldering cave. 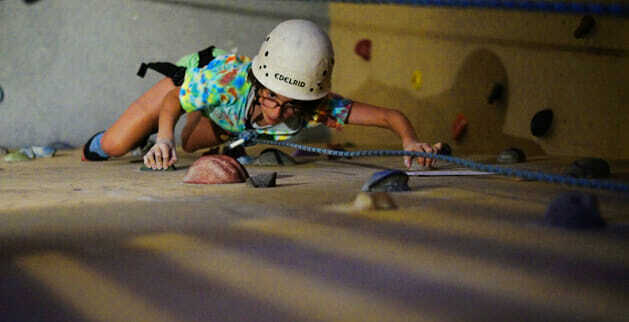 Campers learn safety, knot tying, belaying, and climbing techniques from experts. Field climbing trips go out into the Adirondacks: one of the nation’s finest rock climbing areas. We own a fleet of sailboats which enables our campers to learn the fundamentals of sailing. to that of “skipper” or “admiral”. that play against outside competition. Our five courts serve as the site for expert instruction in ground strokes, service, volleying and strategy. inter-sports competition or the annual Pok-O Open. production during each camp season. the “beach” and the field. The rules, strategies, and skills required for any given sport are just some of the aspects covered during our hour-long daily instruction periods. Participation in inter-camp sports is not mandatory, yet during the course of the full camp season, we find that virtually every camper gets involved. Anyone and everyone can be on a team and will get a chance to compete. There’s an activity for everyone! Our campers are constantly at play. Within the confines of their sections, Pok-O-MacCready boys and girls have a wide variety of enjoyable athletic games in which to participate. Additionally, each summer we stage numerous intra-camp contests and tournaments. Parents will be happy to know that their child’s summer camp experience can include a variety of team sports. 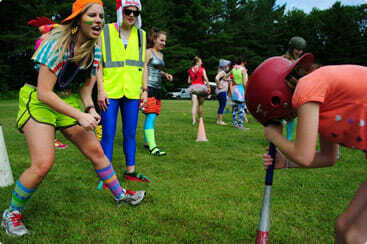 Many Pok-O-MacCready campers play sports during the school year and don’t want to shake that competitive spirit at camp. We don’t disappoint. *All teams are Co-Ed except for girls softball and soccer. Under the guidance of a Riding Director and full-time instructors, five daily one-hour classes are offered. Campers can choose to take riding every day or every other day. Naturally, the classes are designed to fit the rider’s level: beginner leadline; basic walk, trot and canter; posting; hunter skills; and all levels of jumping. In addition, campers practice safety, while learning about the purposes and application of riding equipment: the saddle, stirrups, reigns, bit and crop. As the summer at camp progresses, campers are assured improvement, and are able to advance from one level to the next. Many of our most experienced riders return year after year, and continue to hone their riding skills while enjoying everything else camp has to offer. Day trip to the Lake Placid Horse show to watch advanced riders. This unique and highly successful program gives campers the opportunity to develop a strong bond with their horses throughout the summer. Horsemasters wake up early and, with the help of the riding staff, feed, groom, and muck for their horses before heading to breakfast themselves. 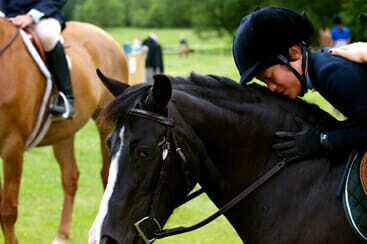 The program gives another dimension to the riding program by teaching campers about all aspects of horse care. Each horse is the responsibility of the same camper or set of partners for the whole summer, and the campers do their jobs each morning and evening thoroughly and with pride; it is a very rewarding experience for campers and staff alike. A summer highlight for many campers is the ability to take part in horse shows. Each weekend, riders travel to local Adirondack equestrian competitions. While the shows present the ultimate challenge to riders, they are also designed to encourage fun and participation. Classes of all levels are offered and every rider leaves with a ribbon. The equestrian summer is punctuated by two “MacCready Horse Shows,” in which campers and outside entrants compete in front of a crowd of very enthusiastic friends and visiting family. Horse shows are not just about competition: they also provide campers with the opportunity to concentrate on a goal, as well as visit new places and meet new people. With our commitment to riding, there is no limit to the instruction and activities offered at Pok-O. Each year, campers visit the “I Love New York” show in Lake Placid, one of the nation’s largest professional Grand Prix events. Campers spend the day watching top level competitors and being with their riding friends. In the past, field trips have been taken to the racetrack in Saratoga as well as the National Equestrian Hall of Fame. Being up on stage affords campers the opportunity to express themselves differently than is possible in other day to day activities. As actors and actresses campers are asked to explore situations that range from mirroring our own culture to imagining worlds that are wonderful and fantastic. Along the way our campers develop skills like working with others, projection & enunciation, idea generation, working within a framework, letting go of inhibition, developing an idea, conflict resolution, and much more. At Pok-O-MacCready campers take part in what the stage has to offer without sacrificing all the other important activities that make up such a memorable summer. Every year, all our campers have opportunities to perform for their peers during section activities, weekly Moonshiners, Saturday morning club skits, big game activities and much more. Our camp has had a long tradition of theater productions dating back to our inception. Over the years we have produced existing Broadway plays, as well as, our own camper & counselor written works. Most recently our campers performed an original musical of “Once in a Lifetime” written by Pok-O-MacCready’s own parent, counselor and professional children’s entertainer – Tim Seston. In 1992, Tim Seston was introduced to Pok-O-MacCready by his wife, Sally Zimmerli (counselor from 1989 – 1993). These past 25+ years he has heard the stories, visited the grounds, and been indoctrinated into the camp culture. In 2016, Sally and Tim’s oldest son Charlie started as an Intermediate. In 2017 Sally and Tim’s twin boys, Luke and Owen were Pioneers. Tim came to camp as well and joined the staff as the Director of the Creative Arts Program. Outside of camp Tim is a professional children’s entertainer and performs regularly for schools and private parties. Tim is also a former science / math teacher and loves playing all kinds of sports. Tim, Sally, Charlie, Luke and Owen live on campus at Concord Academy in Concord, MA where Sally is the Dean of Students. One of the camp’s most popular events, held each summer during the first session, is Tribal Games – unmatched in terms of passion, excitement, and intensity. Campers are divided into five tribes of the Iroquois Nation (Cayuga, Mohawk, Onondaga, Seneca, and Tuscarora). 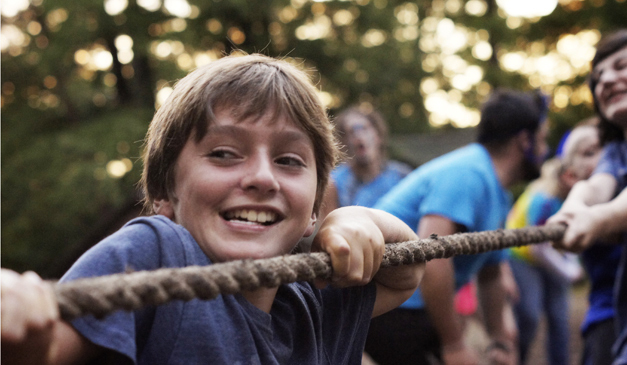 While some of the events are standard popular fare (Tug of War, Relay Race), others events are unique to our camp, such as “Rolas,” the world’s most complicated game! 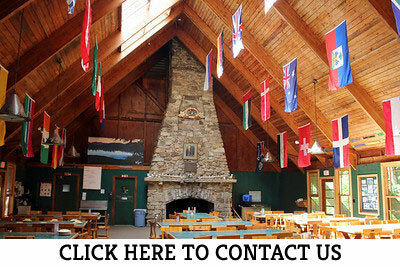 Whatever the event, every camper ages 6-16, embraces his or her role in contributing to the tribe. The kids are in charge during Tribal Competition. Staff acts merely as judges and guides. 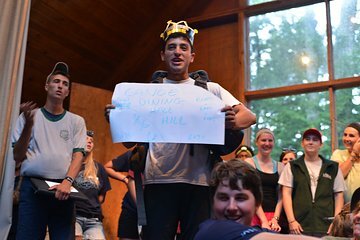 As a result, the campers elect their own tribal leaders, devise their own strategies, invent their own cheers, and construct their own tribal projects. It’s a great exercise in both teamwork and self-reliance. Tribal Games culminate during the final week of the session, with two full days dedicated only to participating in the final events and naming an annual tribal champion! Many campers consider it the highlight of their summer! There is so much more to Tribal Competition than the competitive games and challenges. At the council fire ceremonies, campers also learn of the traditions and honor the heritage of the Iroquois people, the original inhabitants of the Adirondack Mountain region.